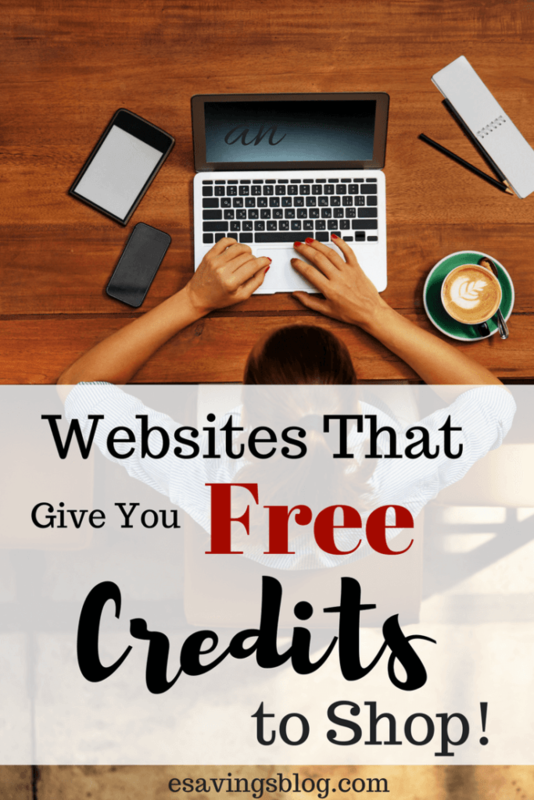 Sites That Give You Free Credit to Shop! There are a bunch of websites that give new shoppers free credits to shop and these same sites will give you more free credits to shop when you refer friends! How cool is that? You are getting free credits to shop and sharing these sites with your friends who also can get free money to shop so its a win-win. This strategy to get free stuff may seem like a lot of work but if you have a lot of friends or family (either in real life or on social media), then you may be on your way to getting all sorts of free products from some popular websites. Even if you don’t think you want to refer friends keep reading because a lot of the sites that I mention will give you a shopping credit just for signing up free, so stick around and save yourself some money. I am in no way at all into pushing products on friends, and this strategy is not that, in fact, it is the opposite because you are sharing great shopping sites that are free to join and often offer shopping credits to your friends to save them money on their first purchase. I love it when I can help other people by giving them money to shop, getting money when they do shop is just a great bonus! Some of the best shopping sites will give shopping credits to the friends you refer, and they will also give you credits to shop after your friend shops through your referral link. The best part is these sites are all free to sign up, and there is no obligation to buy. You may also like The Free Stuff Series: How to get Free Stuff You Actually Want! These companies want to spread the word about their website and need your help to do so, and that is why they give out these shopping credits. Below is a list of my favorites, I am using my referral links in the list just FYI :-). Also, please note that referral credit program terms and amounts change often so while I will try to keep this article updated as best I can feel free to comment and let me know if a link or program is outdated and I will remove or update it! Refer friends and they will send them $10 and, once they sign up, you’ll get a $10 credit for each friend who joins. I love Grove because their products are natural and safe. HOT!!! Right now you can grab a FREE 5 Piece Mrs. Meyers Gift Set when you join using my referral link! Join here. True & Co is an intimate apparel brand that has some very comfy products! Share True&Co. by giving friends $15 towards their first purchase and get $15 for each offer redeemed! Sign up here using my referral link and get $15 for yourself from me then refer friends and earn more $15 credits! New Boutiques open every day (for just a limited time) and are filled with the most sought-after brands at private sale prices. It’s free to join and you can get a $10 credit when you refer friends and they place an order. Sign up and start referring your friends to Ruelala. Erin Condren sells all sorts of pretty planners, notebooks, journals, and more. Check them out and go ahead and Invite a Friend! Get a $10 store credit when they purchase! Plus they get $10 off of their order as well so its great for both of you. Sign up for Erin Condren and get $10 for yourself from me. ThredUP features brands you love at up to 90% off every day. thredUP is the easiest way to shop and sell high-quality secondhand clothes. Refer your four friends and they will get $10 off their first order. You get $10 when they place their first order. Win/win! When you invite a friend to Gilt City, that friend gets $25.00 off their first purchase of $50 or more. Once they buy, you get $25.00 off your next experience. So start inviting. Schoola offers quality clothing at up to 70% off retail with 40% of proceeds benefiting kids! Sign up and you get $10 for you, $10 for your friend, and 40% of the proceeds go to Schools. The more you share, the more you receive! You will get $15 when you use my referral link too :-). Sign up for Schoola. UPDATE: It appears they may have stopped their referral program but I will keep this here in case they bring it back. One Kings Lane is your destination for top-brand & designer furniture, decor, art, gifts & vintage items up to 70% off. And there’s a $15 credit waiting for you! Plus earn $15 when your friend makes a purchase! Use my referral link to get your $15 credit and then refer your friends for more credits to shop! Sign up for One Kings Lane. Beyond the Rack is a private shopping club for women and men who want designer brand apparel and accessories at prices up to 80% off retail. Get a $10 shopping credit after the friend you referred completes a purchase. Earn up to $5000! Zulily has some great sales that you will love. You earn a $15 shopping credit when a new member joins Zulily through your personal link and completes a purchase. Sign up for Zulily and start earning credits to shop for free. Use your personal referral link to share Joss&Main and get a $20 Credit. Each time a friend joins through your link, you’ll receive credit for their first purchase. Ok, so you signed up for the ones you like right? SOme gave you free credits to start so now all you need to do is start sharing these great sites with your friends! They are free so why not? Make sure you go to the section of the website that says something like “refer-a-friend” (make sure you are signed in). Once you get your referral link, you can share it with friends, and you will be on your way to saving a lot of money and getting free stuff. Share your referral link on social media to get the best results or email it to friends! I always let my friends know that I am sharing my referral link with them so that they know and I also let them know that they can do the same afterward. Remember its a WIN-WIN for both you and your friends and family. I will keep adding to this list as I find more. Let me know in the comments any of your favorites! There are some new ones for me. I love shopping discounts! I am going to be adding more as I have time. There are so many great ones that I personally have shopped and loved. Your Welcome! Thanks for visiting Esavingsblog! I tried ThredUP before through a friend’s referral. It is awesome to save some money. All great to know as we head into the online shopping season! Its definitely a great way to save money and help your friends save money. It’s all about referrals in the online shopping industry! I love the idea of helping each other out for freebies. Love discount shopping. There are some new ones for me to check out. Glad you found some new ones, I will be adding more so be sure to come back and check the list. I’ve done the Erin Condren discount before! That’s the only one I knew so far. What a great list! I think I have used all of these and LOVE THEM!! Who doesn’t love a bargain? Thanks for this! Thank you for sharing these referral sites I have never heard of them but they sound great! Great resources! I haven’t tried to work with those companies, I would love to try. Thank you so much. Thanks for the great list of referral links. I am going to take a closer look. I’m a member of most, but there are a few new ones. Thanks! What a great list! I’m a member to some of these and I love saving money.